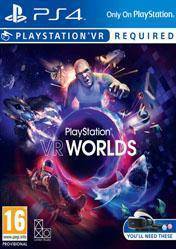 Compare the best prices for Worlds VR for PS4 and buy it in any of the online shops below. Worlds VR is a new experience that includes five unique adventures, where we will can enjoy the whole experience and emotion that is able to offer the new Playstation VR device. We will live firsthand the excitement of preparing for a heist, to survive the persecution of the police and supporting a brutal interrogation. Another of the adventures that we will live is the immersion, where we´ll can explore the seabed with surprising and realistic visual effects. We´ll can pilot a spaceship through an asteroid belt and even face other alien races in stellar battles. An amazing adventure awaits you in this new title specially designed for the new Playstation device. Remember that to play this title you must have Playstation VR and Playstation camera. There are no comments yet about Worlds VR. You can be the first one!